Greek government puts into effect what Shipping and Island Policy Minister Theodoros Dritsas said on Sunday concerning Greece’s intention to equally distribute the refugees and immigrants throughout the country, if there is no European solution. With 25,000 immigrants and refugees trapped in many places all over Greece, the government is looking for places to host them. One of the solution announced on Monday morning is hosting a large group of refugees at Antonis Tritsis Park in Ilion, Athens. As mayor Nikos Zenetos confirmed to protothema.gr, Greek army has started setting up tents for about 800 refugees and immigrants, while the army has been setting up tents since Sunday at former Greece’s airport at Elliniko and particularly at Baseball Centre, according to information. Pantelis Pandelidis passed away on the morning of Thursday 18th February following a fatal car accident. The 32-year-old singer lost control of his vehicle while driving on Vouliagmenis avenue in the area of Elliniko, Southern Athens. Pantelis was driving a Jeep at high speed and crashed against some car barriers. There were two other passengers in the car with him and it was reported by the police that Pantelidis and the 30-year-old sitting next to him were not wearing seat belts however the young woman, 21, at the back was wearing one. The singer was rushed to hospital but it was too late; the two women he was with are both in critical conditions. A traffic police officer said, “Even a seat belt would not have rescued him, he was fatally injured by a piece of the crash barriers that had penetrated the Jeep”. The beloved, self-taught singer and songwriter was buried on Saturday 20th February where tens of thousands of mourners including family, friends, fans and other singers attended. The funeral service took place at Agios Spyridonas church in Nea Ionia. There was a band present playing Pantelidis’ songs and hundreds of flowers were brought for the young singer; so many in fact that they had to be loaded into three trucks. The singer was buried in Athens’ cemetery of the Transfiguration. The coffin was covered with a Greek flag as he served as an officer in the Greek Navy for 10 years before perusing his career in music which launched him into fame in 2012. An estimated 20,000 people attended the funeral. Europe is in very critical crossroads because we have to tackle at the same time three crisis in parallel: the financial crisis, the security crisis and the refugee crisis, Greek Premier Alexis Tsipras said, entering Justus Lipsius Building for the European Summit in Brussels. “We must remain united and show solidarity, but united and with solidarity everywhere, not only in the North-Western side of Europe, but also in the South-Eastern, also in the Mediterranean,” he pointed out. The solution of the refugee crisis, he added, “is not building fences and promoting racism. The future of Europe is not walls and xenophobia. Europe cannot be rules for some and à la carte for others”. Greek singer Pantelis Pantelidis died and two female passengers were seriously injured in a car crash early on Thursday. According to media reports, the singer driving a Mercedes lost control of his vehicle and crashed against the crash barriers at around 8.30 am on Vouliagmenis Avenue, southern Athens. Pantelidis was transferred to the nearest hospital, where he was pronounced dead. One of the two women on board was severely injured and has undergone surgery, while the other, according to local media outlets, is in critical condition. Pantelidis, a self taught musician, was born in 1983 in Athens. This years Barclays Premier League season has been an interesting turn of events with Leicester City on one of their greatest streaks in the league. Except from their recent 2:1 loss against Arsenal on Sunday 14th February they still have a decent chance of winning. With Tottenham defeating Manchester City 2:1 as well on Sunday any of the top four teams in the league which includes Leicester City, Tottenham Hotspur, Arsenal and Manchester City all have a chance of glory. With Jamie Vardy becoming the Premier Leagues number one goal scorer of 19 goals, he is sure going to become most teams transfer targets in the summer window because of the incredible season he has had. Not to forget his partner Riyad Mahrez that has been destroying their opponent’s defence with his incredible balls skills and shot accuracy, he is sure to be on that transfer target list too. Ministers are considering lowering England and Wales drink-drive limit by a third to match the tougher Scottish levels that have been in place since 2014. They want to reduce the alcohol level limit from 80mg in 100ml of blood to 50mg. The new limit is equivalent to a small glass of red wine or half a pint for a woman or a large glass of red wine or a pint for a man. Andrew Jones, a transport minister has proposed the idea to parliament and wants to discuss with Scottish ministers how much safer the roads would be with this new limit. Andrew Jones has said that he wants to base decisions on evidence so this is only the early stages to changing the rules. Jones has stressed the importance of “a balance between safety and personal freedom”. Road safety experts have been putting ministers under pressure to toughen up the law, as England and Wales limits are the highest in Europe. Jones is responsible for road safety and said: “Britain continues to have some of the safest roads in the world because we crack down on those who break the law, and the government believes rigorous enforcement and serious penalties for drink-drivers are a more effective deterrent than changing the drink-driving limit”. If this were to happen it would be the first time the limit would be reduced in 50 years. In today’s news, it was reported that a recently-deceased 107-year-old man credited his incredibly long life to red wine. Antonio Docampo Garcia who died at the age of 107 in Vigo, Spain last week, claimed he reached 107 by drinking four bottles of red wine daily. Antonio’s family said that he thought drinking red wine is the secret to living a longer life. Antonio made and drank his own organic, chemical-free red wine. He would drink two bottles with his lunch and two bottles with his dinner. His son Miguel Docampo Lopez said, “he never drank water”. His son went on to add, “when we were both at home we could get through 200 litres of wine a month”. Antonio had his own vineyard that he set up in Ribadavia, North West Spain after the Spanish Civil War; the company is called ‘Bodegas Docampo’. Past research has found that a glass of red wine with dinner can lead to healthier hearts and better cholesterol levels. However, it serves well to note that Docampo drank his own wine free of preservatives and added chemicals. This being said, preservative free or not, we don’t personally encourage you try the Docampo Garci red wine diet and instead remind you to enjoy responsibly, by the glass and not the bottle! On Tuesday 2nd February 2016 there was an explosion on a Somali jetliner, which created a wide hole on the side of the plane. During the flight the pilot had to make an emergency landing at Mogadishu airport. Once the explosion occurred a man was reportedly sucked out of the side of the plane, two other passengers had minor injuries while the others were still safe on board just scared. According to reports, a police officer in nearby Balad town, said residents had found the dead body of an old man who might have fallen from the plane. Once the plane safely landed one of their passengers Darren Howe told the BBC that from what he saw it was not an explosion but he assumes it might have been a fuselage failure when they were 10,000 feet in the air. Contrary to this, former member of the US National Transportation Safety Board, John Goglia said: “We don’t know a lot, but certainly it looks like a device”. Speculations and theories continue but at this point everything is a theory. EasyJet has opened a 25p store in Park Royal, North West London called the easyFoodstore. The store opened on the 1st February and sells everything from digestive biscuits to chickpeas and pasta. Every item in store has been priced at 25p; this price will remain throughout February as an introductory offer. However, an easyJet spokesman has suggested that they may increase products to 50p thereafter. The owner of EasyJet entrepreneur, Sir Stelios Haji-Ioannou is hoping that this store he has launched will rival Aldi and Lidl who are also discount stores. Haji-Ioannou also added that “this is another way the ‘easy’ brand can serve the less well-off”. True to this, the store motto is ‘No expensive brands, just food honestly priced’. Richard Shackleton, communications director for easyGroup said that the reason for this store opening is to help people who are on low paid jobs or on benefits and can’t use food banks any more. If this store is successful then they are hoping to open another store inside the M25. It has been confirmed that this year’s Eurovision Song Contest will see Greece and Cyprus facing the Eurovision’s first Semi-Final, which airs on Tuesday 10th May 2016. 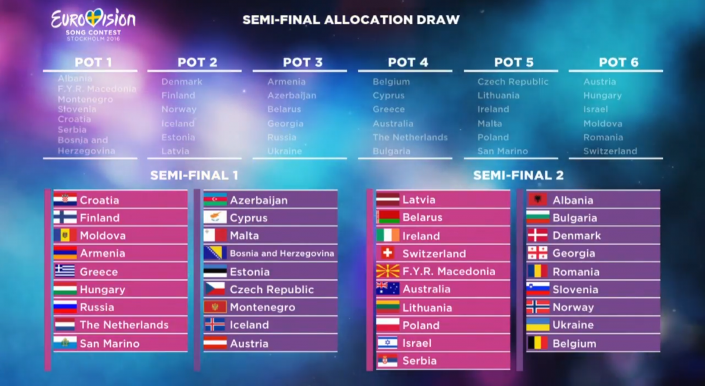 The countries found out their fate at Eurovision’s Live Allocation Draw, on the 25th January at City Hall in Stockholm. The way the semis are set-up, will mean only 10 qualifiers will make it out of each semi final and progress to the 14th of May Final, a few days later. 43 countries will be participating at this year’s Eurovision, of these 20 semi final qualifiers will make it to the final night. Hoping to clinch their place will be our Greek and Cypriot entry, competing among 18 countries, in the first sing-off. The five direct finalists will be again, UK, Spain, Italy, Germany, France and Sweden who won the right to host after Måns Zelmerlöw winning entry, ‘Heroes’. This is what we know so far: Cyprus entry have Minus One represent the nation with a song called ‘Alter Ego‘, which the boys co-write, with Swede composer Thomas G:son. The tune only recently recorded in Stockholm, amidst temperatures of only, in fact -1 °C, will be officially premiered for the first time on 22nd February, really soon it appears. The five piece band made up of vocalist, Francois Micheletto, will be assisted by fellow band members Harrys Pari, Costantinos Amerikanos, Antonis Loizides and Chris J, who will be collectively playing the drums and guitar. The Greek entry is almost certain to be selected internally by the Greek State Television, or ERT. Sources have also suggested; the song will be of a Greek feel, or ethnic style, illustrating the nation’s incredible music to the rest of the fellow Eurovision nations. At the Ceremony of drawing the semi-finalists, this year’s official Eurovision Slogan was revealed, ‘Come Together’, Martin Österdahl, Executive Producer of the 2016 Eurovision Song Contest said: “The Eurovision Song Contest is never about borders, politics or ideologies. It is about reaching across all the boundaries that separates us human beings from each other”. The show producers will allocate definite running order of the songs of each semi, likely by the final week of March.